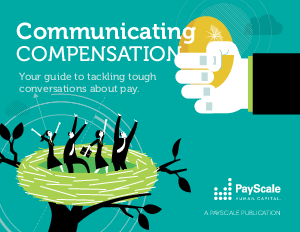 > PayScale > Communicating Compensation - Your guide to tackling tough conversations about pay. Even for the most confident HR managers, discussing compensation isn’t easy. Whether you’re rolling out a new plan, championing a new strategy or just getting ready for performance reviews, it’s critical to communicate effectively. We’ve broken our e-book into the five sections we’ve observed are crucial to having successful discussions about compensation across your organization.